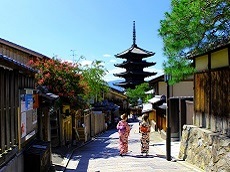 Sanjusangendo Temple is the popular name for Rengeo-in, a temple in eastern Kyoto famous for its 1,001 statues of Kannon, the Goddess of Mercy. 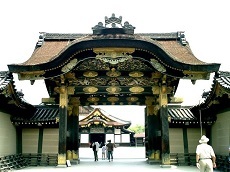 The temple was found in 1164 and rebuilt once after a fire destroyed the original structure in 1266. Since being rebuilt, the temple has had some slight modifications, including a new gate and orange corridor in the gardens. The garden in the temple is a popular spot for tourists to take photos of the tranquil scenery while cherry blossoms are in bloom. 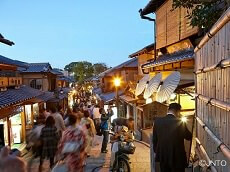 There is also the annual archery event held every January to celebrate the new year. Rows of men, women, and children compete to hit a target 60 meters away with their arrows. If you stop by the during the archery contest, be sure to see if a Monk will perform the Yanagi-no-Okaji, said to help alleviate headaches. The 1000-armed Kannon have 11 heads and 1,000 arms to witness and help fight away the suffering of humans. Note, the actual statues only have 42 arms each. When you subtract the two regular arms on each statue and multiply by the 25 planes of existence, you get the full 1,000 arms. At 120 meters (~394 feet) in length, Sanjusangendo is Japan's longest wooden structure. 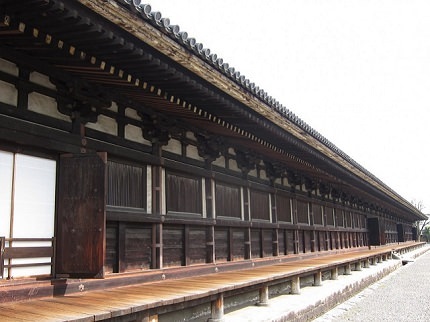 The name Sanjusangendo stems from the traditional method of measuring buildings in Japan. This method uses the number of intervals between a building's support columns, resulting in the name Sanjusangendo or 33 intervals. 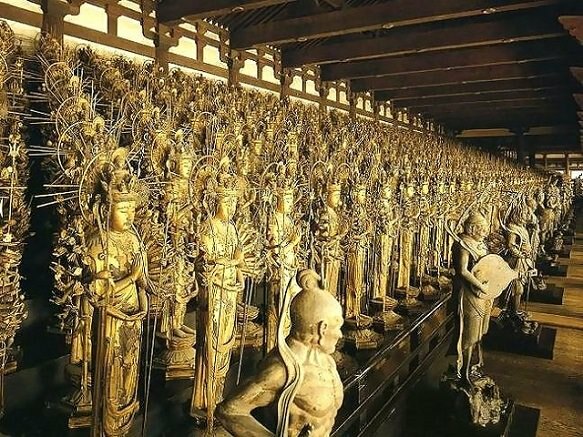 In the center of the main hall is the massive 1,000-armed Kannon (Senju Kannon) made of wood, surrounded by 500 human-sized Kannon statues in ten rows. Be sure to have your camera ready when you enter the hall!